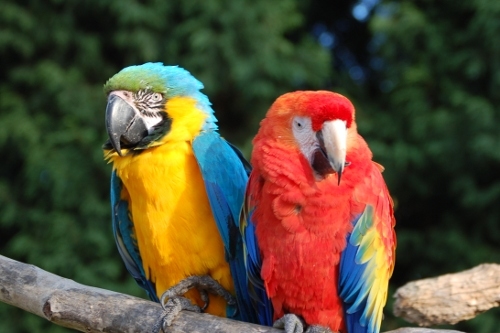 I have been to Tropical Birdland in Dresford, Leicestershire on two occasions. The first was a warm spring day when I took our toddler on my own, and the second was on a cold autumn day with my wife, child and baby. Although we enjoyed both visits it was a far better place for children and especially babies in the summer rather than the winter. Most of the site is outdoors so you do expect it to be cold, but you don’t expect it to be quite so cold in the restaurant and baby changing areas. 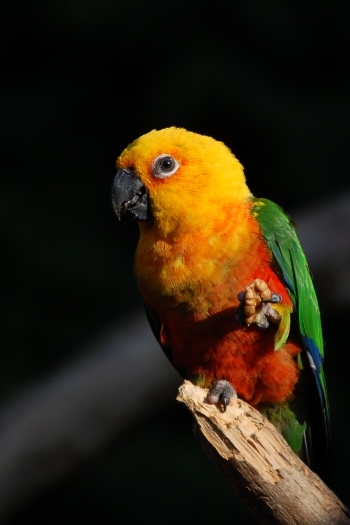 The main attractions are the free flying parrots that enjoy landing on the guests. 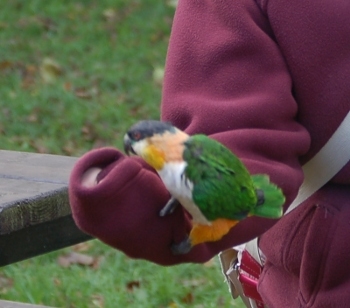 These provide a great opportunity to get up and personal with the birds, but don’t worry if you are a bit squeamish about having a bird land on your head as most need a little gentle coaxing before they will land on you so there is little risk of one landing on you if you don’t want them to. There is a risk they may peck / bite, but again this is only likely to happen if you are trying to get the birds to land on you or if you are silly enough to put fingers through the cages! The toilets and baby changing are in a separate building which does not appear to have any heating. This makes it rather cold for changing a baby, or indeed for a child using the toilet. The baby changing is in the disabled toilet mounted on the door. Due to the construction of the door the baby changing table is very high. I was able to use it okay, but then I’m over 6 feet tall. Some parents will struggle with the height of the changing table. I’d recommend a visit to the Tropical Birdland, but it is much better to visit on a warm spring or summers day than a cold autumn day. This entry was posted on Tuesday, November 11th, 2008 and is filed under Babies, Children, General, Tourism. You can follow any responses to this entry through the RSS 2.0 feed. Both comments and pings are currently closed.